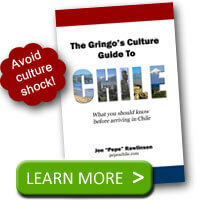 I never knew what a Cherimoya was until I arrived in Chile. 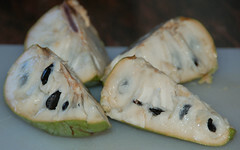 Cherimoya, the fruit, is also known as the custard apple in English. The cherimoya fruit is a native of the Andean region in South America and grows in Chile and enjoys higher altitudes. 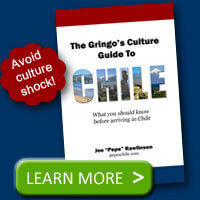 I first heard the shouts of “Chirimoya Alegre” by vendors that would jump on the buses that crisscrossed Santiago. These guys would sell “Chirimoya Alegre” or literally “Happy Cherimoya” ice cream bars that offered a cool respite from the hot summer days in the city. These ice cream bars were based on the flavors of a traditional Chilean dessert called Cherimoya Alegre. Cherimoya Alegre combines chunks of the Cherimoya fruit with orange juice. This is usually served in a bowl, with the orange juice poured over the cherimoya pieces at the time the dish is served. I’ve seen the fruit name spelled Cherimoya in English and Chirimoya in Spanish. So you may see either spelling if looking for the fruit in your local store. Chirimoya goes really good with white wine, sort of like a sangria. Just cut the chirimoya into medium pieces, add a little sugar to taste, pour a bottle or 2 of white wine (you can use cheap wine…) and stir. You can add some strawberries too. When you serve it, make sure to spoon out some fruit on every glass. Asides from being delicious, it looks pretty. You can use combine colors… melons and cantaloupe are good too….. ENJOY!! Yes !, Chirimoya is a delicious Peruvian fruit !